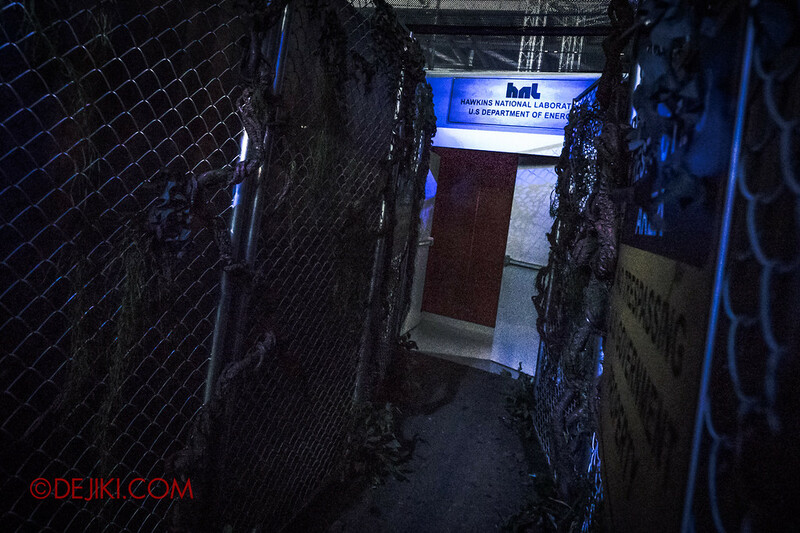 Be the first to explore the Stranger Things haunted house at USS Halloween Horror Nights 8 now! Thanks to Resorts World Sentosa, I got an opportunity to travel to Hawkins and into the world of Stranger Things – from screen to screams. 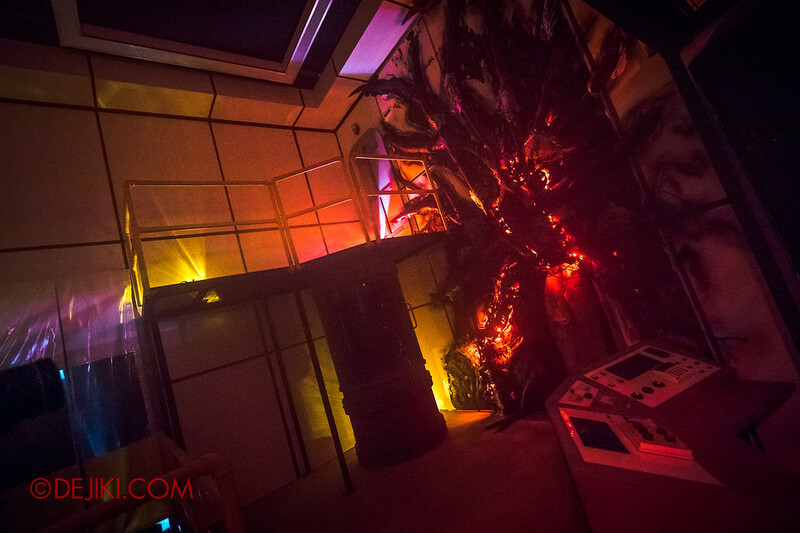 NOTE: The walkthrough photo tour does not include all the scenes, characters and special effects in the house. 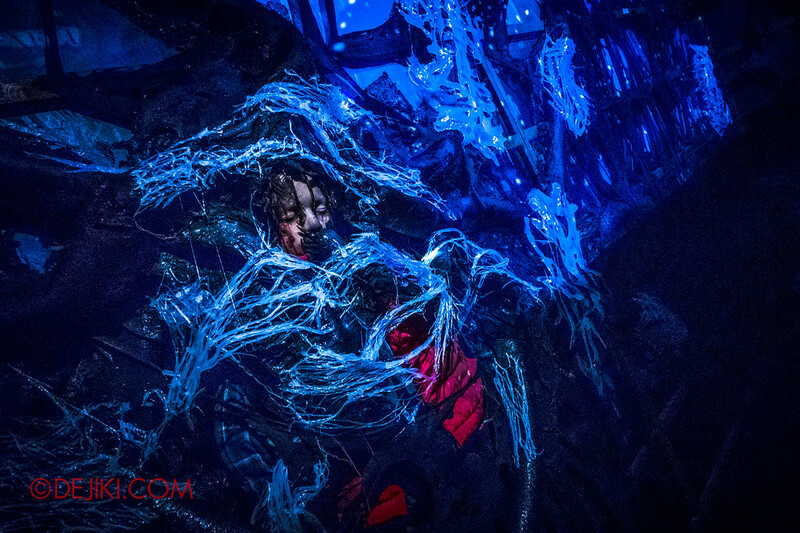 Get the full experience at Halloween Horror Nights 8! Stranger Things is probably the most anticipated house at Halloween Horror Nights 8. This is the first time Universal Studios Singapore built a haunted house based on a major intellectual property (IP), and a world’s first for three Universal Studios theme parks to partner with Netflix, bringing the popular series to reality. Brace yourself for a giant version of the show’s iconic logo, before you step into the horrors within. Will Byers‘ abandoned bicycle, and lingering hints of a lurking Demogorgon. Meet a distressed Joyce Byers, who filled her home with numerous lamps and chains of Christmas lights to contact her son, Will. There is an uncanny resemblance to the famous scenes in Stranger Things – right down to the sound effects. 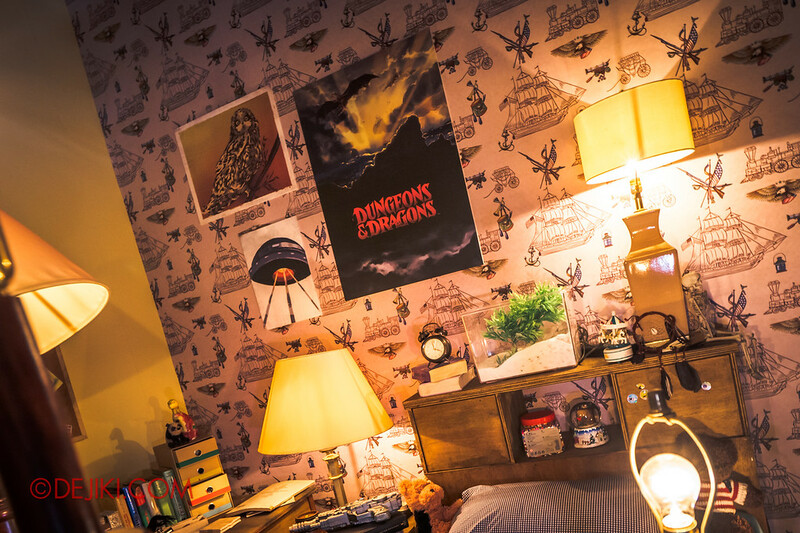 The lights flash erratically, and suddenly, the room darkens and only three lights flicker… R-U-N.
After leaving Will’s bedroom into the Byers’ shed, you’ll find yourself in the eerie forest of Mirkwood, where a Demogorgon awaits. Your only way out is through a Portal… which you’ll have to crouch through. Along the way, you’ll stumble into the back entrance of Hawkins National Laboratory. 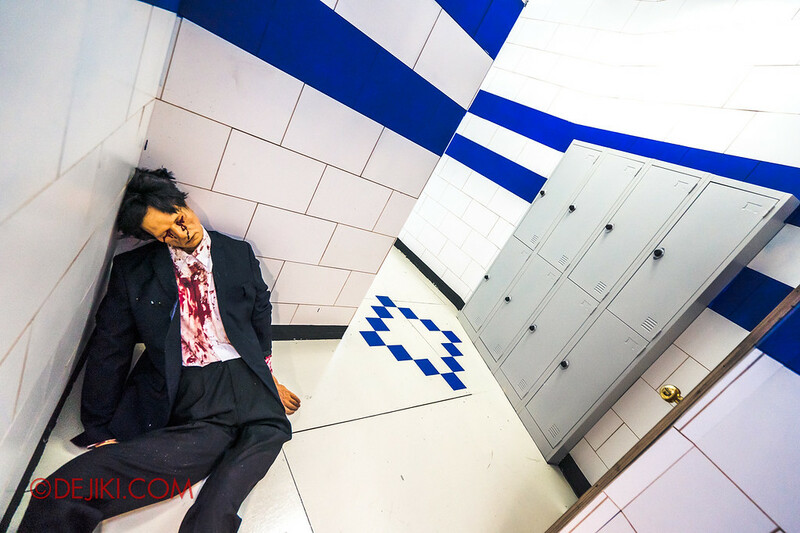 The show’s Elevator Scientist scene (from Season 1 Episode 1) is recreated here, executed with a stunt effect only seen in Singapore. 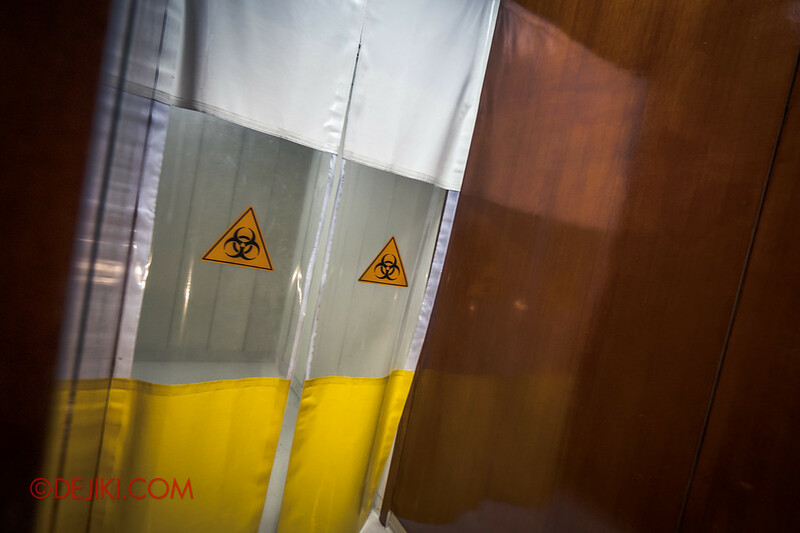 In one of the expansive lab scenes, you’ll see the Sensory Deprivation tank where Eleven was trapped in, as well as another unique stunt effect in this scene. 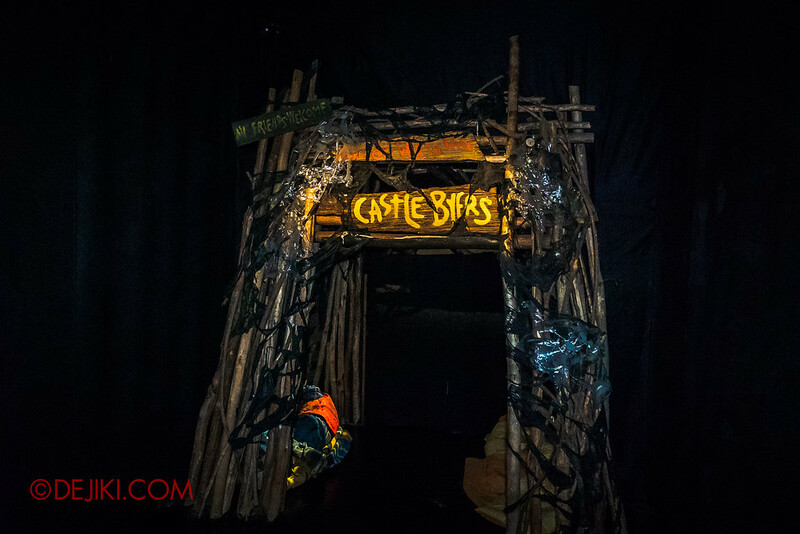 Also only in Singapore: Your chance to enter and hide inside Castle Byers, Will’s fort in the forest. And it is possible to find Barb if you are lucky enough. Rush back to Hawkins Middle School, where you will find Demogorgons phasing into the hallways, as well as agents from Hawkins Lab. 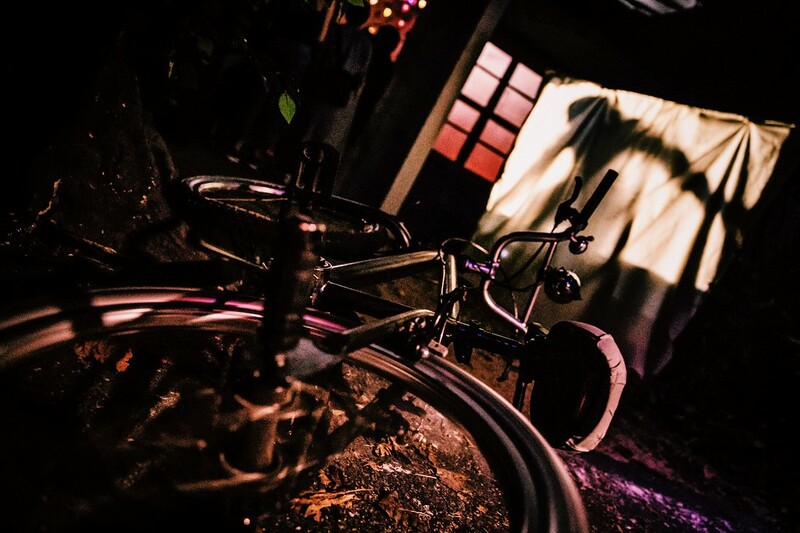 The Stranger Things experience ends off with an epic showdown between Eleven and a Demogorgon, and as a special twist in Singapore – you’ll get to be completely immersed in the action. I had the opportunity to walk through the house twice – first without effects, and second time in show mode with just a few scare actors performing. 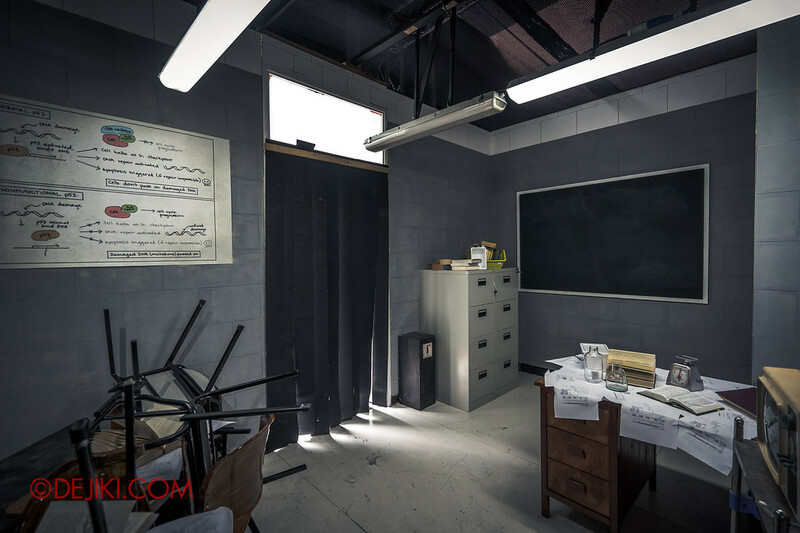 Without a doubt, this haunted house is an amazing experience that has recreated a slice of Stranger Things. For fans of the series, you might get goosebumps just walking through the scenes in your search for Will Byers. Those not familiar with the show are likely to enjoy the immersive Hollywood-style production. A 20-minute summary of the show will be screened in the queue to get you up to speed. Speaking about queues, there might be some surprises in store, such as encounters with characters while waiting in line. Although all three parks included key scenes adapted from the show, the houses are not copies of one another. Singapore’s haunted house is constructed outdoors, at the Breezeway beside Soundstage 28. Unlike past haunted houses built there (Inside The Mind, Hawker Centre Massacre, Tunnel People and Jing’s Revenge), Stranger Things in Singapore extends out of the Breezeway’s roof so that it can fit an extended experience comprising 12 key scenes. The Singapore house wasted no space – with barely any black corridors and most scenes being very compact. Clearly these would set up very intense scares. Transitions between the scenes are tight and kept realistic – you’ll need to crouch through portals into the Upside Down. 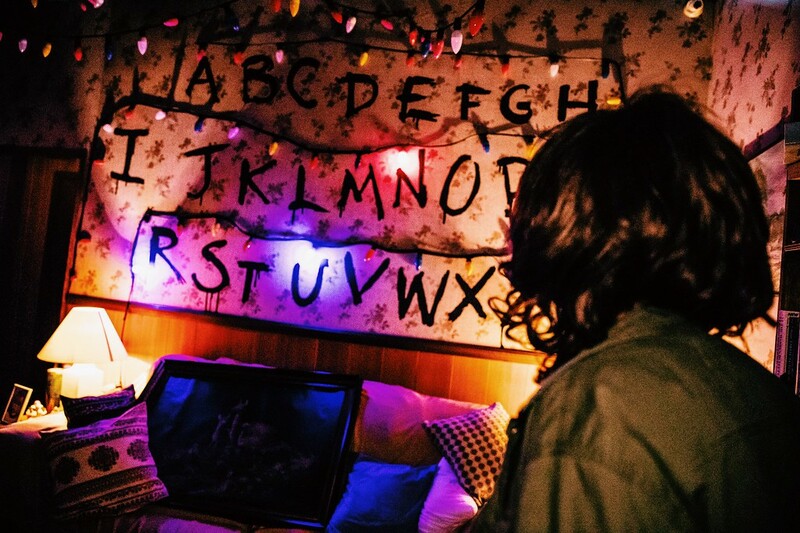 Singapore also adapted Hollywood’s superior audio design, curating the most iconic lines and sounds effects from the series, to draw you further into the world of Stranger Things. If you’d like a sneak preview of the sights and sounds, here’s a video of some of the scenes filmed at the preview. 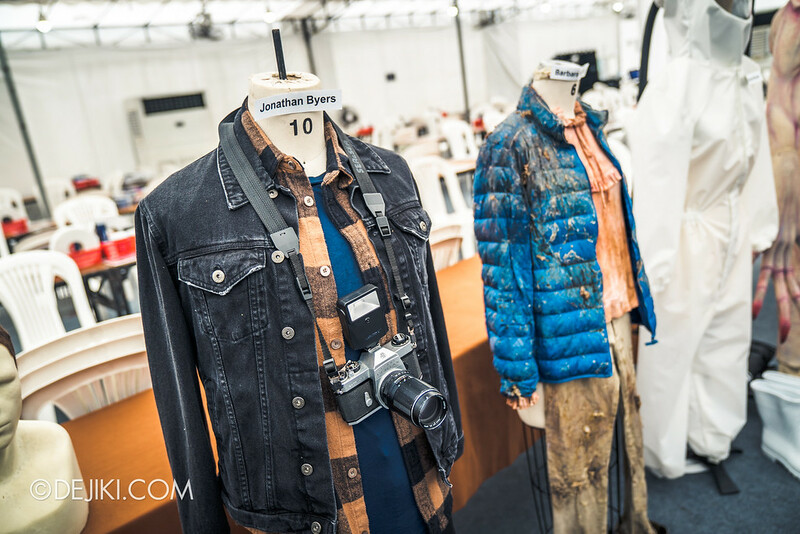 As part of the media preview, I got a closer look at some of the costumes and make-up. 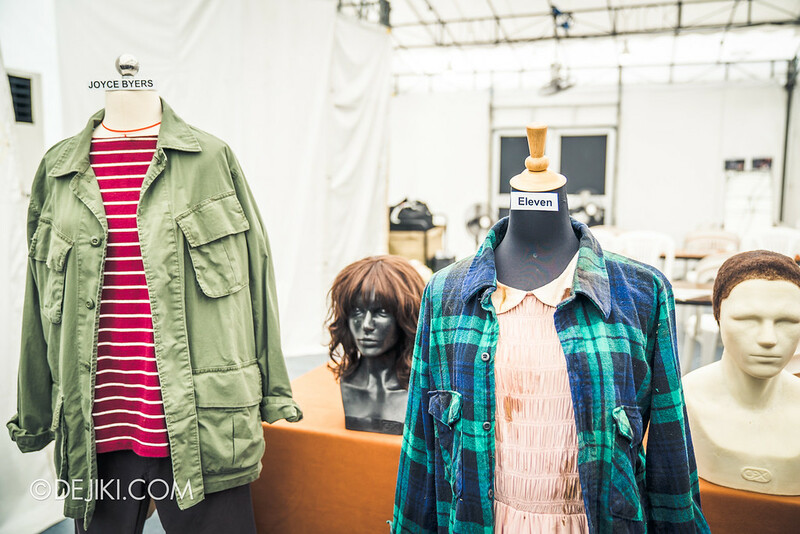 To create authentic looks, the costuming team studied the show extensively. The new pieces that they sourced had to be altered and weathered for accuracy. If there’s anything that they couldn’t get and adapt, they had to make from scratch. USS will have two characters portrayed by live actors that are not in other parks: Jonathan and Barbara. Barbara’s top was custom made, and her puffy jacket had many layers of effects added to illustrate her fatal misadventure in the Upside Down. Similar to Universal Orlando’s outstanding maze, Eleven will be portrayed by live actors in Singapore. And of course, we’ll meet several Demogorgons and Hawkins Lab’s Hazmat Scientists. The Demogorgon mask and suit are designed and produced by the same company that did the costumes for Stranger Things mazes in Hollywood and Orlando. 2018 Halloween Horror Nights merchandise is finally here. The Stranger Things items are similarly branded as the US parks, but marked with ‘Halloween Horror Nights 2018’ instead of the HHN8 logo. Stranger Things ‘Dustin’ Trucker Cap – S$20. This looks like a Singapore exclusive item. Universal Studios Singapore’s Halloween Horror Nights 8 opens on 27 Sept through 31 Oct 2018 on select nights. Tickets are available online at halloweenhorrornights.com.sg, or you can also buy them via my Klook link. 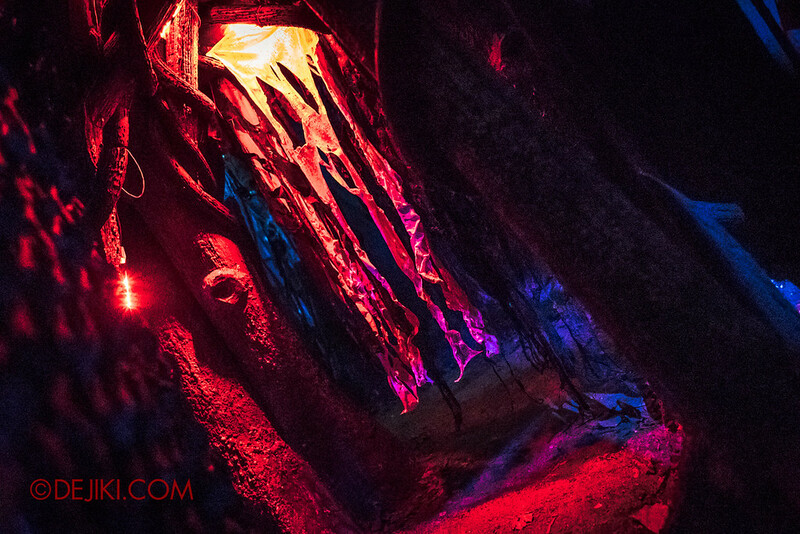 Get all the info you need about Singapore’s ultimate Halloween event at my Halloween Horror Nights 8 Tickets and Event Guide post. 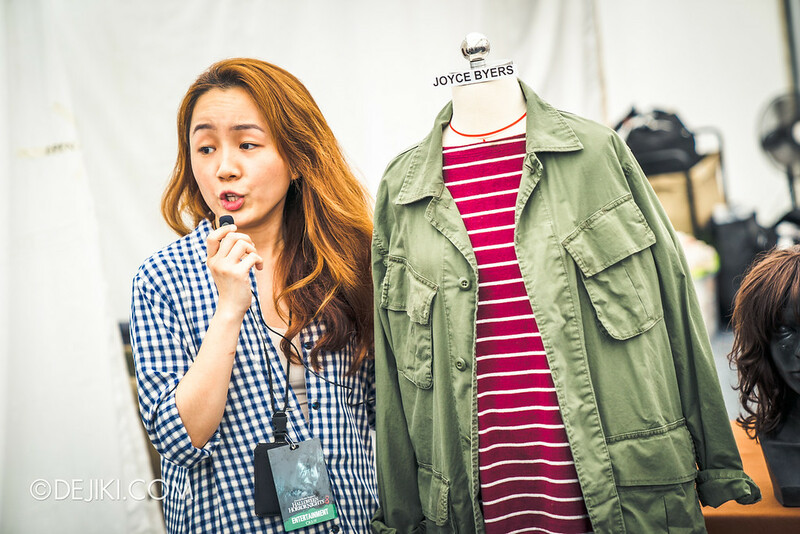 Additional Photography by Tong Ming. Yes, BTS will cover the two houses in New York zone, which are Stranger Things and Killuminati. Is there other hhn merchandise Not including stranger things? Do you think we need to watch the series Stranger Things first to feel the correlation with this haunted house? If that’s the case, in what season and episode of Strangers Things based on? The Stranger Things house is based on Season One of the show. A 20-minute summary of key Season One scenes will be screened at the queue. Is it possible to just buy tix the bts tour? No – it is bundled with the RIP Tour Mastercard promotion only.